Note: This was written by a 16 year old client participating in substance abuse treatment at Youth Services. Part of the treatment includes writing a letter to their drug of choice. Dear alcohol, I’m writing this letter to say goodbye. Although it seemed that we had some good times together, in reality you used and abused me for many years. I’ve been returned to sanity and realize that I no longer need you to live my life, for the entire time we were together, I was not living, I was just surviving. Remember the first time we met? I was only 10 or 11 years old and my friend was about… 17? Why you would get introduced to me at such a young age I’ll never understand, but you were willing and so was I. From that time on we became very close friends. I remember many nights tagging along with my sister and friends just hoping to get some attention from you and sooner or later I always did. Driving around good old Salt Lake City, getting hammered in the back seat of some dudes car. Always sneaking into my house at the crack of dawn. Oh! And remember the time some friends and me found you in an abandoned refrigerator? Boy those were some good times, weren’t they? I was always waking up to find you gone, replaced by my face in a bucket as a morning greeting. Yet you always came back, ready for another night of adventure. Boy we had some nights. How many? I couldn’t even begin to count them all out. Looking back now, there have been so many good times with you. But as much as this kills me to say, there have been more bad times than good. We’ve got a lot of history together; we’ve made many memories together; you were my favorite team mate in every game of pong; you have had quite the impact on my life. For how long our relationship has lasted, I wish I could say that you weren’t a waste of time. But I’ve got to be honest, you were. You brought more stress and heart ache to my life than happiness. You made me do things that I would have never thought of doing if I would have been sober. I guess I can say a couple of good things about you. You have helped me meet a lot of amazing people that I honestly have no idea where I would be today without. But you’ve also helped tear many, many relationships of mine apart. Including helping in the fallout of my family. You and me aren’t good together baby. So now I think is the perfect time to say goodbye. I know it won’t be forever, so don’t be too sad. But till then, this is the end of you and me! If you could write a letter to your “drug of choice”, what would you say? Youth Services became my second home six years ago as I ventured into the social services world. As the Public Relations and Communications Coordinator, I manage the online and offline communications materials, organize special events and coordinate volunteers and donations. In my "free" time, I enjoy singing/songwriting, snowboarding and swimming. 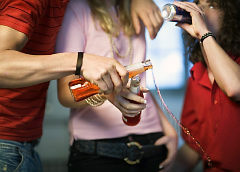 This entry was posted in Substance Abuse, Teen Counseling, therapist and tagged alcohol, beer, effects of alcohol, teenage drinking, teens and alcohol, teens and beer, underage drinking. Bookmark the permalink.